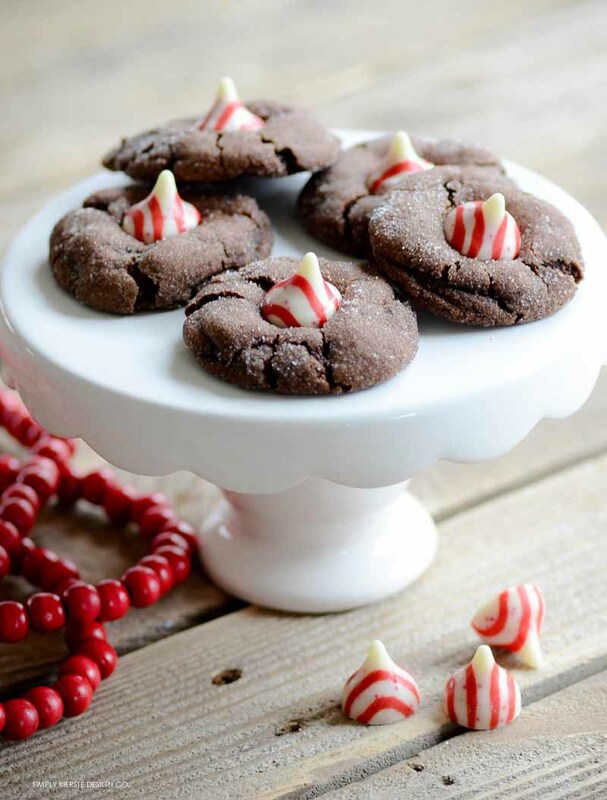 Chocolate Peppermint Blossoms | Simply Kierste Design Co.
Peppermint is one of my favorite holiday flavors, and I LOVE it with chocolate. The pairing is a match made in heaven, and heavenly would be the perfect way to describe these cookies. When I came across Candy Cane Kisses at the store last week, I knew exactly what I wanted to do. 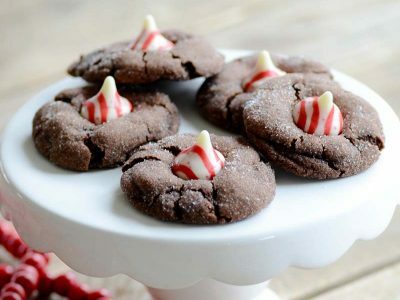 I took the popular Peanut Butter Blossom cookie, and traded out the flavors for a delightful Christmas cookie…Chocolate Peppermint Blossoms! 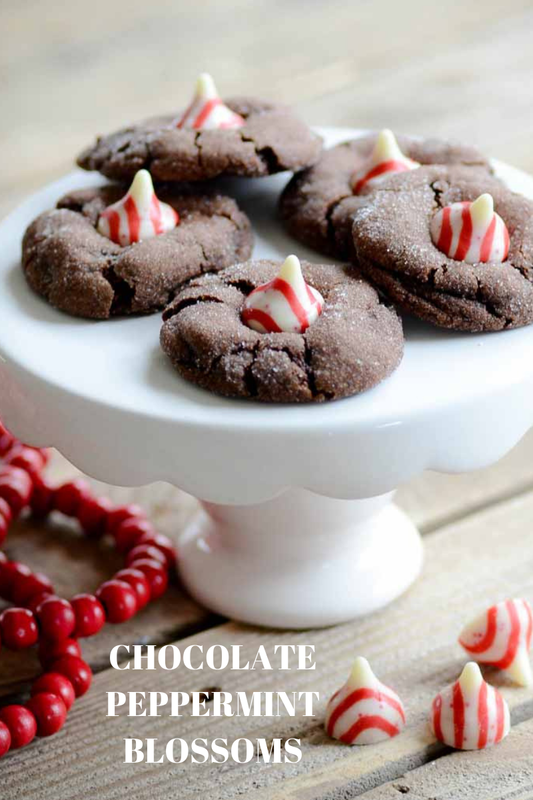 The rich, chocolate-y cookie, with that little creamy bite of peppermint on the top…it’s absolute perfection. 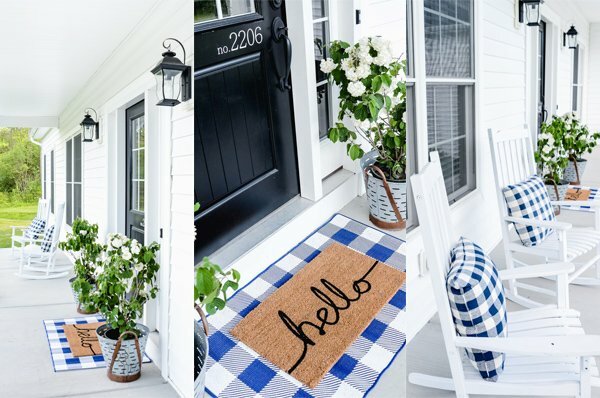 And isn’t it so adorable and festive? I love love the cute stripes on the Candy Cane Kiss! I love this chocolate cookie–it’s one of my favorite basic chocolate cookie recipes, and it’s an easy one to do different things with. It also bakes up just the right way–not a lot of spreading–so it would be just right for a blossom cookie. I like to roll my dough in sugar before baking, because it not only gives the cookies a little bit of a crunch on the outside, but also a little bit of sparkle. This is the cookie that you can serve at a party, take to a cookie exchange, give to friends and neighbors, set out on your holiday table, or make on a for y our own family. Just remember to make extras, because they have a tendency to go very quickly! Beat butter until creamy, then add sugars. Beat in eggs and vanilla. Combine flour, soda, and cocoa, then add to the butter mixture, beating well. If your dough is really soft, you can refrigerate for 30-60 minutes. Roll into small balls ( a cookie scoop works great! ), then into the 1-2 Tbsp. white sugar. Place on a cookie sheet that's been lined with parchment paper or foil and sprayed with cooking spray. Bake for 7-8 minutes at 375 degrees. If your oven tends to bake quickly, check them around 6 minutes--don't overbake! As soon as they come out of the oven, press a Candy Cane kiss in the center of each cookie. Remove the cookies from the cookie sheet as soon as possible, so the kisses don't melt. There’s no cocoa listed in your measured ingredients btw. Is the chocolate missing in this recipe? Did you use Nutella or cocoa? SO sorry, everyone! I added the cocoa to the ingredients. That’s what I get for typing up the recipe at 12:30am, lol. Thanks for letting me know! The dough was really sticky, I can’t roll it into balls. I have it chilling in the fridge for a few, hopefully it helps! So sorry! I haven’t had that happen before! Chilling should definitely help–maybe adding a little extra flour next time would work too. I stuck the kisses in the freezer for awhile beforehand so they didn’t melt. And I did make the balls too big the first time but used some oil on my hands to roll them up without the mess. They turned out great! My cookies turned out flat and undercooked, even after being jn the oven for 10 minutes. They immediately fell apart during transfer. Any tips? I followed the recipe to a T.
I didn’t think about refrigerating or freezing the kisses; that would have helped as ours melted all over the place for the first few batches, when we put them on immediately upon removing them from the oven. After that, we used a guessing game as to the right time to add the kisses to the cookies. We chilled the dough for an hour before baking the cookies which helped with the cookie scoop idea. Do you space the cookies before baking or let them touch? Yes, I space them apart.